New Orleans-themed bar and restaurant near the United Nations. 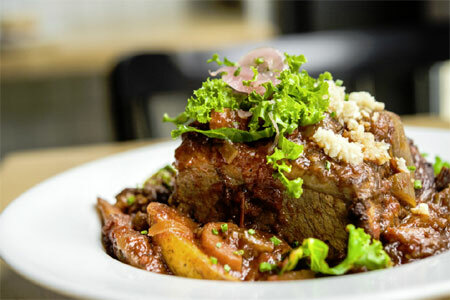 : Midtowner Masq is a casual, innovative restaurant that prides itself on taking New Orleans-inspired dishes and giving them a distinctive edge. The setting feels like a New Orleans home, with long rooms, white-washed wood walls, Mardi Gras masks, a velvet sofa and seductive lighting. Jambalaya is New Orleans andouille sausage and spiced chicken but with a slather of creamy goat cheese. Mac ‘n' cheese croquettes mash up two Southern dishes with satisfying richness and heat. Other Louisiana favorites like a shrimp po’ boy sit side by side with more northern creations such as prosciutto and fig flatbread and crab cake sliders. While Louisiana cocktails are on the menu, it’s the eclectic, international selection of wines that is the true surprise. Carefully curated, the Italian reds and New Zealand Sauvignon Blanc pair especially well with the often spicy dishes.